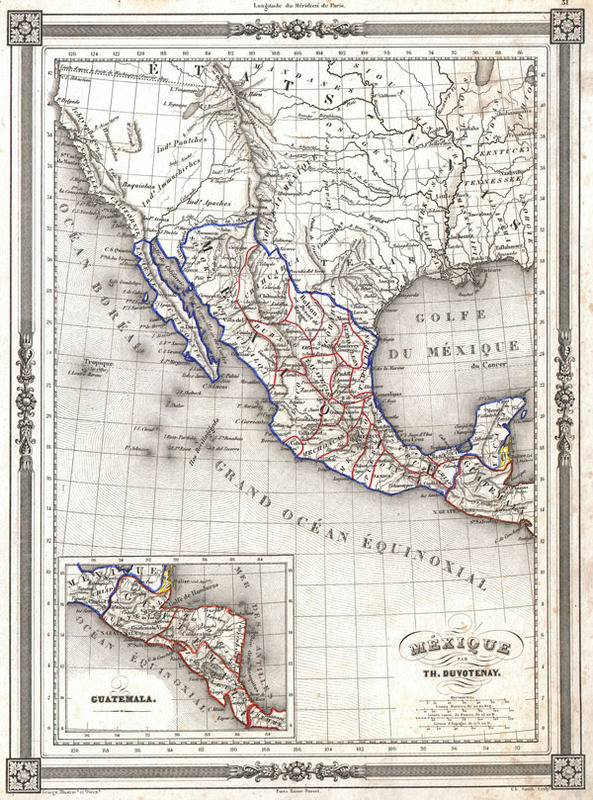 An uncommon and extremely attractive 1852 map of the Mexico by Th. Dovotenay. Includes all of modern day Mexico as well as Texas and the territories (Upper California) claimed by Mexico prior to the 1849 Treaty of Guadaloupe-Hildago. Shows the Mexico – U.S. Boundary line prior to the Gadsden Purchase. Offers a number of fascinating elements including pre-Fremont cartography in Upper California. The fictional rivers Jesus Maria and Wimmetchke are shown extending eastward from San Francisco Bay. Labels the Great Salt Lake as Lake Teguayo after José Antonio de Alzate y Ramírez. Lake Teguayo is said by some to be the legendary homeland of the Aztecs. To the north of Lake Teguayo, today's Lake Utah is labeled Lake Timpanogos. Texas appears at its fullest extent. Mexico itself is divided into its various intendancies. An inset in the lower left quadrant focuses on Guatemala. Features a beautiful frame style border. Prepared by Th. Duvotenay for publication as plate no. 31 in Maison Basset's 1852 edition of the Atlas Illustre.